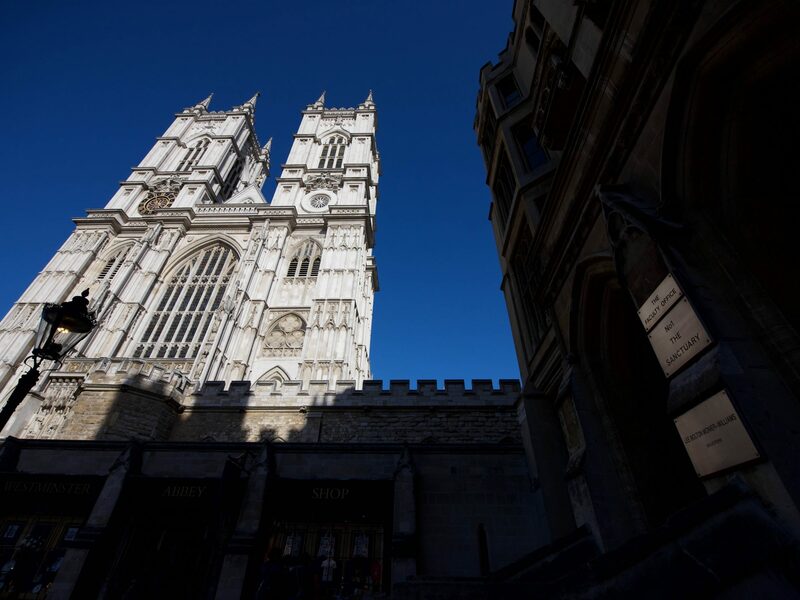 The AC became an accredited supplier at Westminster Abbey in 2016, and we hosted a dinner in the beautiful setting of Cheynegates in celebration. Here is a little about the celebration dinner and some ideas about using the venue to hold an event. Our dinner guests were enchanted by the architecture of The Chapter House, enjoying Champagne and canapés in this tranquil space which was also the place where Parliament met in the 14th century before transferring to the Palace of Westminster. With incredible acoustics, it is the perfect location for evening receptions where quiet music is featured. The accreditation coincided with Her Majesty The Queen’s 90th Birthday celebrations, and in commemoration, Ralph Heimans was commissioned to paint this dramatic portrait which looks down on proceedings from the wall. The Cloisters sit adjacent to the Nave of Westminster Abbey and offer spectacular views across the Garth. Built in the 13th and completed in 14th century, this atmospheric open space is perfect for parties during the warmer months. Back in the 14th century, monks stored food and drink in The Cellarium, a medieval undercroft with a highly ornate, vaulted ceiling. This feature makes this the perfect space for an evening dinner or reception. The Cellarium Terrace showcases a stunning blend of past and present architecture, yet offers a contemporary event space in the otherwise historic building. Also, it offers fantastic views of the Abbey’s West Towers and provides access to an exclusive outside area, consequently making it perfect for drinks or dinner. This 900-year-old garden is believed to be the longest continually cultivated garden in England and is the perfect spot for a quintessentially English garden party. Holding an event at the Abbey affords guests the opportunity to take a private tour to areas not available to members of the general visiting public. What better way to conclude a private dinner or reception in this iconic and most famous of buildings than to have a privileged view of the Shrine of Edward the Confessor and Poets Corner. At our celebration, several guests praised the tour by remarking on how honoured they had felt to see such national treasures and in the company of knowledgeable and personable guides. Westminster Abbey conducts Royal Weddings and Weddings for family members of those knighted by HM The Queen into the Most Honourable Order of the Bath. Therefore requests to hold weddings or wedding receptions at the Abbey cannot be accepted.